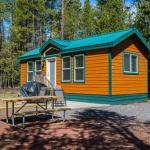 Situated in Sunriver Bend-Sunriver Camping Resort Cottage 4 offers accommodation with a seating area and a kitchen. Complimentary WiFi is featured. All units feature air conditioning and a flat-screen TV. An oven and coffee machine are also offered.